Drax The Destroyer to Join Avengers 3? 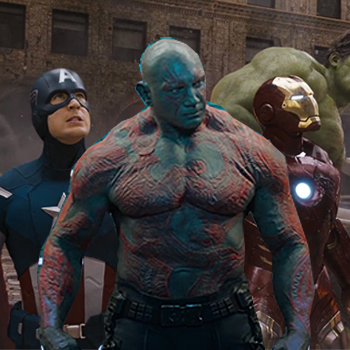 Wrestling news site reports Guardians' David Bautista may be getting a bigger role in the Marvel Cinematic Universe. Guardians of The Galaxy is the #1 movie of the year (in the U.S.) thus far and just became the first Marvel debut-feature to exceed the box-office of the original Iron Man. In other words: Drax, Groot, Rocket, Gamora and Starlord are the new superstars of the Marvel Cinematic Universe - and it looks like they're wasting no time in expanding their presence. Just about the easiest prediction anyone can make is that The Guardians would meet The Avengers at some point, and now a pro-wrestling news site is reporting that at least one Guardian is already being set to do just that. According to the report, WWE Superstart turned actor David Bautista (who portrays the super-strong, metaphor-averse warrior Drax The Destroyer) is "restructuring" his deal with Marvel in order to appear in more features. Along with the already-announced Guardians sequel, he's described as having a "significant role" in Avengers 3. While no plot details of either film (to say nothing of Drax's role therein) have been released or confirmed by Marvel, it's worth noting that the expected villain of Avengers 3, Thanos the Mad Titan, featured prominently in Guardians. In addition, Drax and Thanos were conceived as eachother's arch-enemies in the original comics.